(The Philippine Star) | Updated June 18, 2017 - 12:00am MANILA, Philippines - At least 9,000 evacuees from Marawi City who transferred to Iligan City have yet to receive relief goods as they remain undocumented nearly a month after the armed conflict between the government forces and Maute group erupted. According to social enterprise Ecosystems for Work for Essential Benefits (EcoWEB), its social workers gathered information from evacuees and found out that at least 9,000 remain undocumented and have not received relief items. EcoWEB founder Naneth Antequisa said the documentation of evacuees is expected within the week. 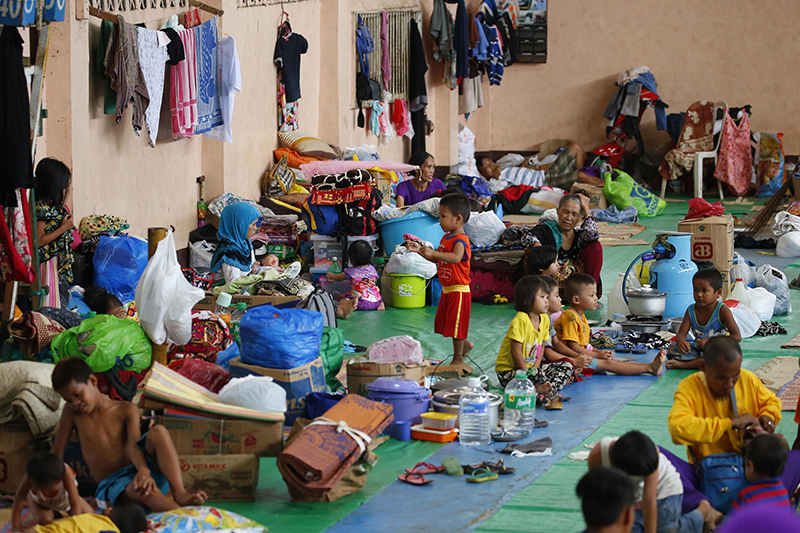 The Iligan City social services office is yet to comment on the undocumented evacuees. Iligan City Mayor Celso Regencia has instructed the city police to do a separate profiling of each evacuee. At least 30,000 displaced residents of Marawi are seeking shelter in Iligan since the armed conflict in Marawi erupted last May 23. Malacañang yesterday assured the public that agencies are working to ensure the wellbeing and safety of evacuees. “We can refer it to NDRRMC (National Disaster Risk Reduction and Management Council), the DSWD (Department of Social Welfare and Development) and DOH (Department of Health). We are just waiting for the response, but I’m sure their action on the ground is much faster than their communication to us,” presidential spokesman Ernesto Abella told state-run Radyo Pilipinas yesterday. “We are doing something about it. The priority and the interest is the health and safety of those who evacuated,” he added. The office of Vice President Leni Robredo is also planning to provide families displaced by the ongoing conflict in Marawi City with livelihood programs in addition to immediate relief items. In an interview in Iligan City yesterday, vice presidential spokesperson Georgina Hernandez said they are looking at providing sewing machines and fabric for some evacuees to enable them to have a source of income. She said the beneficiaries would include a group of women weavers whom Robredo earlier met when she launched her Angat Buhay program in Marawi City in March. Hernandez noted that the Office of the Vice President (OVP), through its Angat Buhay partners, has already raised funds to help establish a production center that could help the weavers. “The day before the Marawi clash happened, we turned over the donation to the non-government organization who will help them. Unfortunately, that has yet to materialize (because of the conflict),” she added in Filipino.